← Yubari Kit Kat Winner! Well, apparently it’s the future! 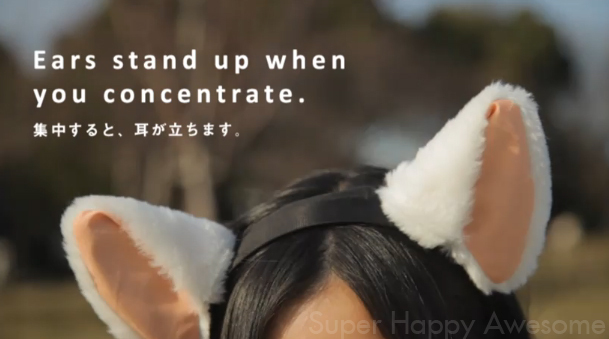 The Japanese company Neurowear has come out with a pair of fuzzy cat ears that claim to read the wearer’s brain waves and react accordingly. When you are concentrating, they perk up and stand tall. When you are relaxed, they droop down to mimic your relaxed state. They even twitch and wiggle about, depending on your mood. It’s a whole new level in body language and communication! Combining the Japanese words ネコ (cat) and 耳 (ear), this new device seems to be at the cutting edge of “cool”. While many have pointed out the potential for cosplay, the possibilites for positive effects in the health care world are interesting too. There’s been discussion of use with the mentally or verbally challenged, giving a new mode of expression to those with limited abilities. Sadly, we missed the demonstration in Shibuya this weekend, but hopefully Neurowear will let us know soon where we can try a pair on for size, or when they might be commercially available. What do you think–awesome, or weird? “It’s the future!” or “Japan, you so crazy!”? Or is it just too good to be true? Is technology truly so advanced? Either way, we’ll definitely try to get our hands on a pair so we can see if they really work! And finally, do you want a pair for yourself? This entry was posted in Japan, Video, you so crazy! and tagged brain, cat, cat ears, cats, cosplay, ears, Japan, kitty, mind, tech, technology, thinking, thought, thought waves, video. Bookmark the permalink. Godddd help meeeee… I want a pair BADLY. Neurowear needs a table in the dealers room ……. Haha, it’s true! They’d be really great in the dealer’s room! how awesome is this?! really want one!! !